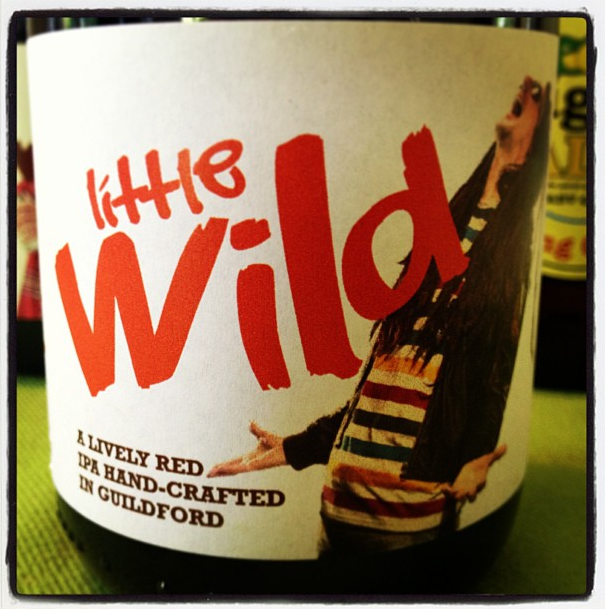 I’ve now sampled a few craft beers created by Jim Taylor of the Little Beer Corporation over the last couple of months and have not been disappointed by any produced from this newish Nano-brewery in my home town of Guildford. I was therefore looking forward to the latest beers I purchased from their store at the Surrey County Show. Jim’s young son and wife were at hand that day and I was extremely impressed with his son’s knowledge. I asked if there were any American style IPA’s on offer and was directed to Little Wild with some useful information about the hops used. Now for me I’m always looking towards a Sierra Nevada or Smuttynose Finestkind IPA as my benchmark for such beers and this is what Little Wild would no doubt be compared against! On pouring it was a lovely reddish brown colour consistent with the breed – it had quite a thick head that disapated quickly but left the right amount on top. There were orange and citrus aromas and the brew was reasonably clear – perhaps a slight cloudiness – this of course doesn’t really bother me. There was no sediment – and I believe this beer is filtered before bottling. The flavour was very rich and rewarding – malty dark sweetness with a sharp bitter finish – and a fruitiness that hits the back of your palate. However I do feel this beer was named after production as it is a little wild – it’s very zingy and the fizziness bursts around on your tongue like popping candy – this is partly what differentiates it from other such beers. So my advice is to give this beer a few minutes to settle down and let stop bouncing off the walls! In summary, another beer that shows this Nano-brewery knows how to select the right ingredients and produce exquisite results – looking forward to trying more! This beer dances around your tongue but then packs in a good punch. A beer with a robust bitterness that is broad and bracing, but held together firmly by a solid backbone of malt. Red in colour, with bright grapefruit citrus aromatics that leap out of the glass. Endlessly appetising. Fragrant, bright, zingy, citrusy, robust and strong. Currently AVAILABLE (May/June 2013) – link to store provided above.